Over the years, legacy work has been carried out in support of JPL thrusts toward the exploration of Mars, Venus, Saturn's moon Titan, and the outer planets (Jupiter, Saturn, Uranus and Neptune) by helping to develop a variety of planetary aerovehicles. These aerovehicles included unmanned balloons, designed to enable scientific exploration by hovering over and/or soft landing on planetary bodies, and a class of inflatable drag devices called ballutes. The balloon activity was part of JPL's overall Planetary Aerobot Program, which was developing balloons to support scientific payloads for up to several months in the atmospheres of planets. 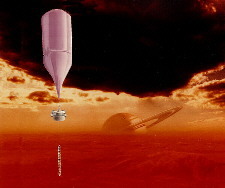 A balloon's unique vantage point would allow sophisticated observational programs to be carried out including the possibility of soft landing and observations from varying elevations. Techniques for actively controlling balloon lift were thus an important part of the development effort to allow a balloon to adjust its elevation, and thus its vantage point and flight path. 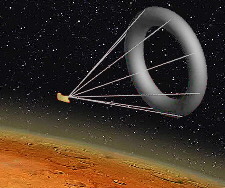 The primary application of ballutes was for planetary aerocapture, a flight maneuver in which a spacecraft would use atmospheric drag to decelerate into orbit at another planet. Also of interest was the related maneuver of aeroentry in which the deceleration is sufficient to bring the spacecraft through the atmosphere to the planetary surface. Detailed descriptions of these legacy balloon and ballute activities and proposed missions are described in the linked pages available via the left NavBar, or by clicking on the above pictures or captions.